Deionized Water, Propylene Glycol, DMAE, Polysorbate 80, Glycerin, Vitamin C-Ester (Ascorbyl Palmitate), Polyethylene Glycol, Coconut Fragrance, alpha-Lipoic Acid, Kiwi Fruit Fragrance, Aloe Vera leaf, Biotin, Vitamin A, Vitamin D-3, Coenezyme Q10, Vitamin E, Calcium Pantothenate, and Chamomile Flower Extract(4:1), Simethicone, Phenoxyethanol, and Aragum. Other ingredients: Warning: For external use only. Do not take this product by mouth, and do not let this product get into eyes. If product gets into eyes, flush with water until it is out, and consult you physician if neccessary. If redness, irritation, or other reaction develops, discontinue use immediately and consult your physician. STORE IN A COOL, DRY PLACE. 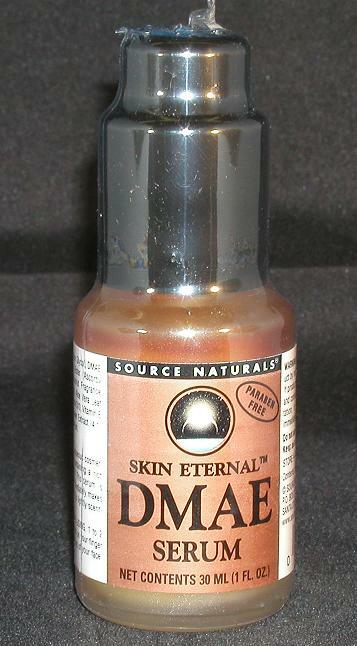 For use on the skin, DMAE is formulated as a lotion. DMAE supplements should never be used during pregnancy. Split face study on the cutaneous tensile effect of 2-dimethylaminoethanol (deanol) gel. Skin Res Technol. 2002 Aug;8(3):164-7 Uhoda I, Faska N, Robert C, Cauwenbergh G, Pierard GE. The role of dimethylaminoethanol in cosmetic dermatology. Am J Clin Dermatol. 2005;6(1):39-47 Grossman R.
 Effects of PCA and DMAE on the nematode Caenorhabditis briggsae. Exp Aging Res. 1978 Apr;4(2):133-9 Zuckerman BM, Barrett KA. Effect of lifetime administration of dimethylaminoethanol on longevity, aging changes, and cryptogenic neoplasms in C3H mice. Mech Ageing Dev. 1988 Feb;42(2):129-38 Stenback F, Weisburger JH, Williams GM.